VIDEO: Sgt. Doug Howell, acting public information officer for Troop H of the State Police, talks about the shooting at River House. The River House Bar and Grill in Londonderry Township was the scene of a shooting early Friday, according to State Police. Sgt. 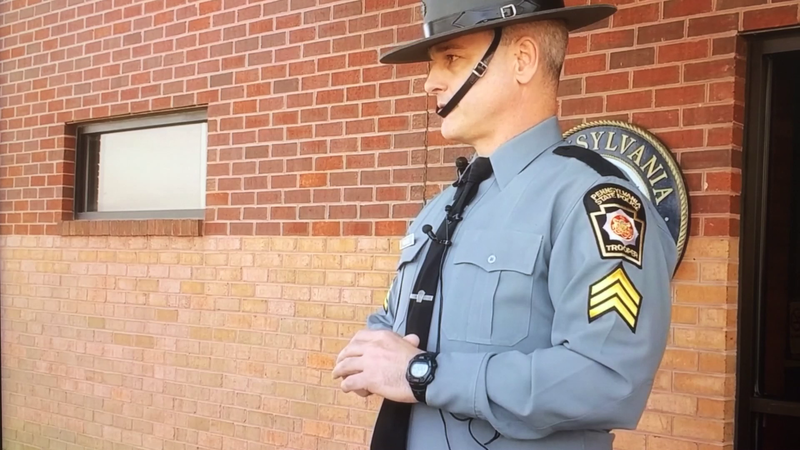 Doug Howell, acting public information officer for Troop H of the State Police, talks to members of the media Friday afternoon outside the Troop H headquarters. It was a busy night at the River House Bar & Grill on Route 230 just outside of Middletown late Thursday, March 23. As the clock rolled past midnight into Friday, there were still more than 80 customers packed into the Londonderry Township bar. But there was a sign of trouble, in the person of a 21-year-old man from Mount Joy, Tanner Allen Stark, according to authorities. Soon, three people would be shot, police would swarm the scene, and Stark would be under arrest. Here is what happened, according to court records and discussions with law enforcement. Stark was a Thursday night regular at the River House, but he had a habit of carrying a gun that could be seen while he was at the bar. A few weeks ago, a River House bouncer had told Stark that if he was seen with a gun at the bar again, he would be told to leave. Stark apparently didn’t heed the warning, or didn’t care. The bouncer sometime after seeing Stark drinking at the bar at about 11 p.m. Thursday confronted him in the bathroom area, and saw that Stark had a handgun in his right front pants pocket. The bouncer left the bathroom area and went to tell another River House bouncer who was working that night that he had seen Stark with a gun again. It is still not clear from State Police reports exactly what happened in the immediate aftermath. Sometime around 1:30 a.m., the two bouncers escorted Stark out of the bar into a deck area, and told Stark that he would not be allowed back into the bar unless he stored the gun in his vehicle or elsewhere — anywhere but inside the bar. Instead of complying, Stark became “belligerent,” the bouncers would later tell police. Walking along a stone wall towards the parking lot, Stark was heard racking the slide of his Glock 19 and proceeded to fire four shots into the bar, breaking a glass window. One of the four rounds “came within a foot of my head,” one of the bouncers told police. Another round fired by Stark hit a 21-year-old man in the leg. Initial police statements said that the man was hit while sitting inside at the bar, but the criminal complaint police would file late Friday afternoon to charge Stark said that the man was outside on the front deck. It is not clear to what extent, if any, the 21-year-old man had been involved in the confrontation between the bouncers and Stark. The man has been identified only as J.R. in police reports, which also noted that the 21-year-old victim refused medical treatment at the scene. After firing into the bar and at the bouncers, Stark turned and ran across the parking lot headed for the woods. Two men from inside the River House left the bar and ran after him, according to the police complaint. By the time it was all over, by about 1:35 a.m., all three men — Stark and the two others — were lying on the ground and injured. One of the two men who ran out — identified in police reports only as 34-year-old “A.C.” — was unresponsive and had been shot in the chest. The other man, also 34, identified as “D.S.,” was conscious. He injured his leg during the melee, but had not been shot, police said. One handgun was found on the ground near A.C., and two others were found on the ground near D.S. Police have refused to confirm the identity of either man. But less than a day after the shooting the River House Facebook page was spreading the word of a Go Fund Me account that had been started for a David Seesholtz – who is being hailed as a “hero” for his role in going after Stark. The post further identifies Seesholtz as a “longtime regular” of the River House and a “dear friend.” “NOT ALL HEROS WEAR CAPES!” the post states of Seesholtz. As of Tuesday morning, March 28, the Go Fund Me page for Seesholtz had raised $7,670 toward its goal of $10,000. Another post on the River House Facebook page sends people to another Go Fund Me account that has been set up to raise money to help Andy Cole — A.C. — and his family. The Go Fund Me account had raised $22,310 toward a goal of $25,000. Of the four victims of the incident — Stark, Cole, Seesholtz, and the 21-year-old who police said refused medical treatment — two were taken to Penn State Milton S. Hershey Medical Center and reported by police as being in critical condition. However, a hospital spokeswoman said Tuesday that Cole and Seesholtz no longer were there. She would not comment on Stark, saying it was a police matter. One of the victims was taken to Lancaster General Hospital. However, he was not in Lancaster General as of Tuesday, according to a hospital spokesman. Updates on the conditions of the three victims taken to the hospital was not immediately available from either the hospitals or from police. Acting state police Troop H spokesman Doug Howell did confirm that all three were still in the hospital as of late Tuesday morning, March 28. Shortly after police had found Cole and Seesholtz on the ground, one of the people in the crowd gathered around them told police that Stark had fled toward the nearby woods. Police soon found Stark, who was hiding under a flatbed semi-trailer near the River House parking lot. He was injured from having received “multiple gunshot wounds,” police said. At this point there are still many unanswered questions. Who fired the shots that struck Stark — both Cole and Seesholtz? One of the two? Someone else? Howell, who has been putting out the information thus far, would not comment when these questions were put to him in an email from the Press & Journal on Monday, March 27. Presumably, Cole was shot by Stark, but even that isn’t clear from what police have said thus far. Howell would not comment regarding how many rounds were fired in all during the incident. Middletown Interim Police Chief George Mouchette confirmed that a Middletown officer responded. Lower Swatara Township Director of Public Safety Frank Williamson also confirmed that his department responded. The investigation eventually was taken over by a small army of State Police officers and detectives. That the State Police spent several hours at the scene is obvious. A man who lives next to the River House told the Press & Journal of seeing a large number of police cruisers at the bar at 4 a.m. But by about 8:30 a.m. Friday, anyone driving by the River House would have seen no indication that anything at all had happened. No marked police cruisers were visible in the parking lot, no yellow tape around any of the building. Nothing. The River House even opened for business as usual, at 11 a.m. Friday. However, River House owner Justin L. Nicholson, in his only public posting regarding the incident on the River House Facebook page, said that there would be “no late night entertainment” at the River House on Friday night, March 24. By the time of that posting from Nicholson — 4:54 p.m. — police had already charged Stark and he was being arraigned in the hospital by District Judge David Judy. Stark — who has no previous criminal record, based on online court records — faces a long list of charges, starting with four felony counts of criminal attempt to commit criminal homicide, five felony counts of aggravated assault, three felony counts of discharging a firearm into an occupied structure, one misdemeanor weapons possession and six misdemeanor simple assault counts — and 82 separate misdemeanor counts of recklessly endangering another person. That’s one for each one of the 82 patrons whom police say were still at the River House at about 1:30 a.m.
Stark also faces numerous summary charges, including harassment, disorderly conduct, and public drunkenness. Judy set Stark’s bail at $750,000. Stark’s name has not yet appeared on the Dauphin County Prison list, indicating he is still in the hospital. His preliminary hearing has been set for April 6, before Judy. Stark doesn’t yet have an attorney to represent him, according to court records. In public statements on Friday, PSP’s Howell said that it is possible that more people could be charged related to the River House shooting. However, no one else had been charged as of Tuesday. There’s been a bar or restaurant type of business at the River House for many years. Back in the early 1980s the place at 230 and Geyers Church Road was known as the TMI Inn. In more recent years it was known as Portabellas. The license that Nicholson currently holds for the River House is still filed under the Portabellas name on the Pennsylvania Liquor Control Board website, although Nicholson rebranded Portabellas as the River House several years ago. The man who saw cop cars in the lot at 4 a.m. said that they had never had any trouble with the River House. A woman in the house agreed. Howell told reporters on Friday that he was unaware of any problems regarding the bar and restaurant. Public licensing information on the LCB website refers to nine different suspensions and/or fines that the business had received from October 1995 through June 1999. But in the nearly 18 years since there have been just four fines and one suspension. The suspension stemmed from a case of simple assault and criminal mischief that the LCB investigated in 2011. The most recent infraction was for the business posting a sign in December 2012 that it was closed for reason other than the license being suspended. The business was fined $500 and the case was closed in February 2014. Nothing appears on the record since then. Today the River House enjoys a reputation for having good food, a reputation that began when the place was still known as Portabellas. Driving past around 5 p.m. on March 27, the parking lot seemed surprisingly full for a Monday night, and the scent of something good cooking made you want to come inside. Nicholson did not respond to a request for comment from the Press & Journal that was left at the restaurant. But his Facebook post on Friday acknowledged the support that the business was already receiving, in light of the tragedy of just hours before.